McCauley & Co.Are You Lagging or Leading on Innovation? - McCauley & Co.
Is your company’s leadership truly dedicated to innovating? Are leaders rewarded for creative fails? Do you recognize the innovation blockers? Recent research from Washington University Olin School of Business is predicting 40% of Fortune 500 Companies will be bankrupt in the next 10-15 years. Continually investing in, encouraging and rewarding innovation puts your organization on the leading edge of the innovation curve. Tap on the link below for our high energy podcast with Patrick Schwerdtfeger, an in-demand business futurist, speaker, and author of four books. His most recent, “Anarchy, Inc: Profiting in a Decentralized World with Artificial Intelligence and Blockchain”, helps leaders understand trends that are shaping a new, decentralized economy. Subsequently, this will change the competitive economic landscape. The steps leaders take now to innovate will mean survival – or conversely, bankruptcy. Patrick is a regular speaker for Bloomberg TV, founder of Trend Mastery Inc and host of the Strategic Business Insights video blog. Today’s podcast is about preparing your company’s leadership now for a new competitive landscape. Patrick’s research highlights the current shift to a decentralized economy and predicts that survivors will be the companies with innovative leadership. Innovation is a function of – and accelerated by – capability. Does your organization have the capability to create or adopt new technology and apply it in ways that will outperform your competitors? Capability is the launch pad that allows your team to create greater efficiencies that lead to reduced costs. This frees up your team’s talent and resources to develop new business models and capitalize on overlooked opportunities. All while continuing to keep up a steady stream of innovative ideas. Leaders must prioritize innovation – regularly making time and allocating a budget for innovative ideas – in order to win. As a Board Member, CEO or Executive Leader, commit to leading your team toward innovation. Hesitation on this front can put your organization on the path to extinction. Understanding and taking action on these recommendations will significantly impact innovation in your organization and set you up to be industry leaders vs followers. In short – this is a not to be missed podcast! 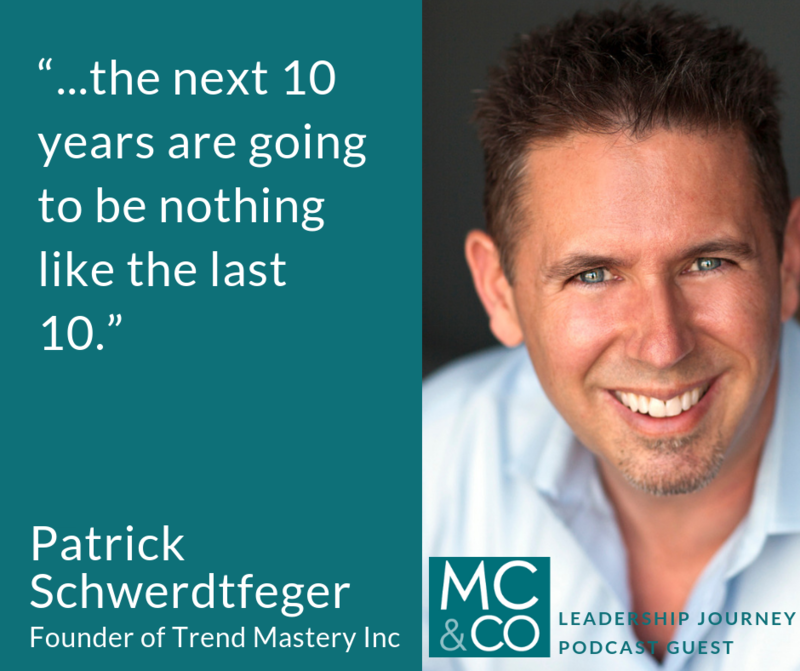 Join me for an insightful and inspiring conversation with Business Futurist Patrick Schwerdfteger about how to identify important trends and be ready to lead your team to them!